Can’t wait for spring to come? 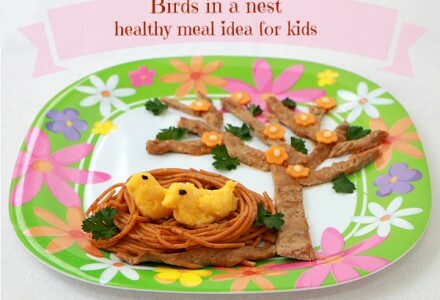 Well, at least it can be in your plate :) Two cute yellow birds in their nest under a tree will cheer up little faces! Delicious and healthy recipe for kids: veal, pasta, cauliflower and cheese. My daughter’s favorite ‘doudou’ is the rabbit, so I decided to make her a surprise. 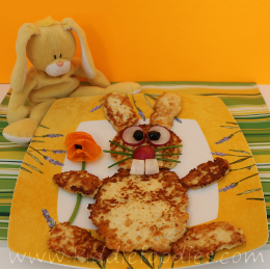 These pancakes made of cauliflower, cheese, egg and flour, together with some small veggies make a delicious meal. She was really happy and ate it all!